I've spent much of today sorting through e-mails, setting up filters to make the flow of suggested actions a little less overwhelming, making phone calls, and starting to get a bit overwhelmed. But look what just came in! I have been waiting for this box since I saw Back to the Future in the theater, which is exactly as long ago as you think it was (unless you're my age, which, sorry, it was probably longer). It is a box full of books which I wrote and were printed and are now books. They are shiny and beautiful, and several of them have places they need to go that are not my house, but for now I'm an authorial dragon sitting on my hoard. For everyone trying to squint at that, it says: "This is Wicked for the Cthulhu Mythos: never quite contradicting, but dancing through the shadows and dredging up beautiful things out of the deep." And it will be in stores in less than a month! I'm reading the galley and enjoying it very much. 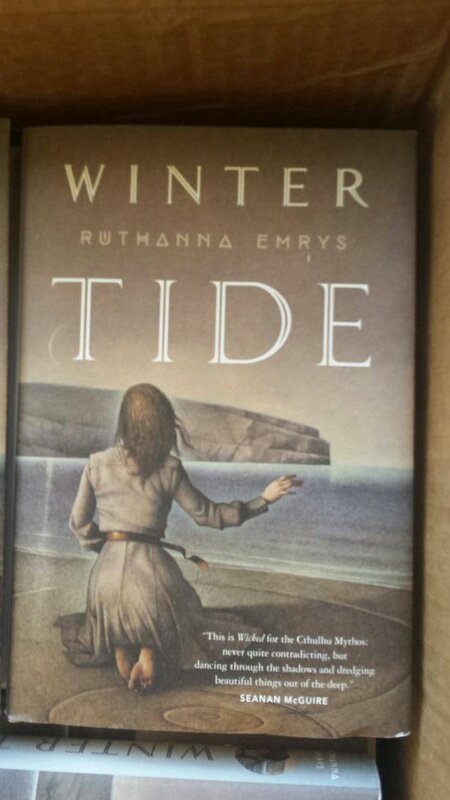 I just bought Winter Tide! I shall see if my willpower allows me to finish my current RPG project before I dive into it.